Get paid for the electricity you generate: the government’s feed in tariffs pay you for the electricity you generate, even if you use it. Cut your carbon footprint: solar electricity is green, renewables energy and doesn't release any harmful carbon dioxide (CO2) or other pollutants. 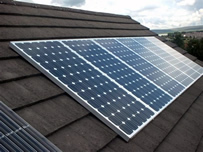 A typical home solar PV system could save over a tonne of CO2 per year - that's more than 30 tonnes over its lifetime. If your system is eligible for the feed in tariff scheme it could generate savings and income of around £670 per year - you will get paid for both the electricity you generate and use, and what you don't use and export to the grid. *this is based on the proposed 21p/kWh rate in the UK Government’s solar FiTS review consultation. If your system is eligible for the Feed- in tariff scheme it could generate savings and income of around £670 per year - you will get paid for both the electricity you generate and use, and what you don't use and export to the grid. ﻿﻿Solar PV needs little maintenance - you'll just need to keep the panels relatively clean and make sure trees don't begin to overshadow them. The panels should last 25 years or more, but the inverter is likely to need replacing some time during this period, at a current cost of around £1,000. Heat pumps are effective solutions to heating and cooling applications for all types of buildings, domestic, commercial and retail premises including hotels and residential complexes. This well-proven technology has been in use for decades and Heat Pumps are at work all over the world providing safe, reliable heating and cooling at affordable prices. Reserves of conventional fossil fuels are finite and emissions of Carbon Dioxide and other greenhouse gases add increasingly to the effects of climate change. 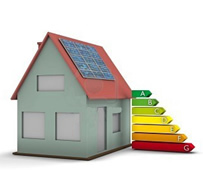 As a low carbon technology, heat pumps can significantly reduce the UK’s Carbon Dioxide emissions.